Projects in Marketing Miner are designed to monitor keywords ranking, mentions, or links regularly. When you create Reports in Marketing Miner, you do that repeatedly based on the data that are changing. But creating Projects is a one-time thing. Once you set up your project, you don&apos;t have to do anything else with it. Just follow its development. You can also share each project with other members of your team. List of your own and shared projects is under the button Projects in the top menu. You can access a specific project by clicking Go to project button. You can create a new project by clicking on button Create new. Creating a project is simple and intuitive. Simply enter your domain, language, and project type. If you have a sitemap, you can add it to the project. Marketing Miner will then download the first 1,000 URLs from the sitemap and regularly check if all URLs are indexable. 200 keywords on daily basis. 1000 keywords on weekly basis. If you don&apos;t know what keywords you want to track yet, don&apos;t worry. Just insert at least a few keywords, and then you can come back later and edit your keyword options. 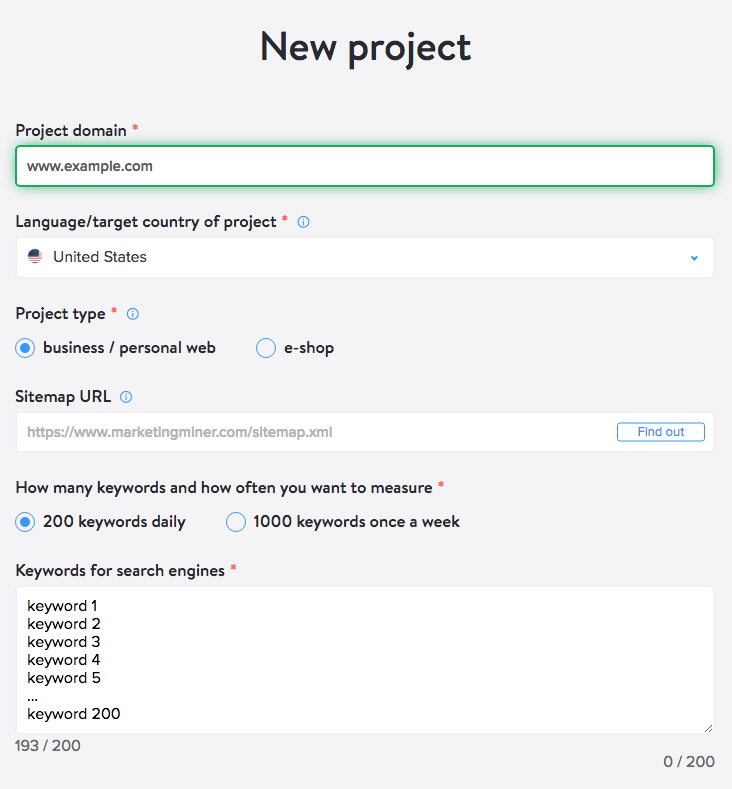 You can do any backward adjustments for keywords, as well as other modifications by clicking on Project Settings in the upper right corner of a particular project. You can share the project with any team member or external contractors. Just click Share Project next to the project setup option. After clicking, you will generate a public URL that you can easily send to anyone. The project can be viewed by whoever has the URL available. The user doesn&apos;t even have Marketing Miner account. But if he or she is signed in to the Marketing Miner, the shared project is automatically added to the list of all projects. This project can then be viewed, but settings are available only for the owner of the project. SERP rank tracking and monitoring.